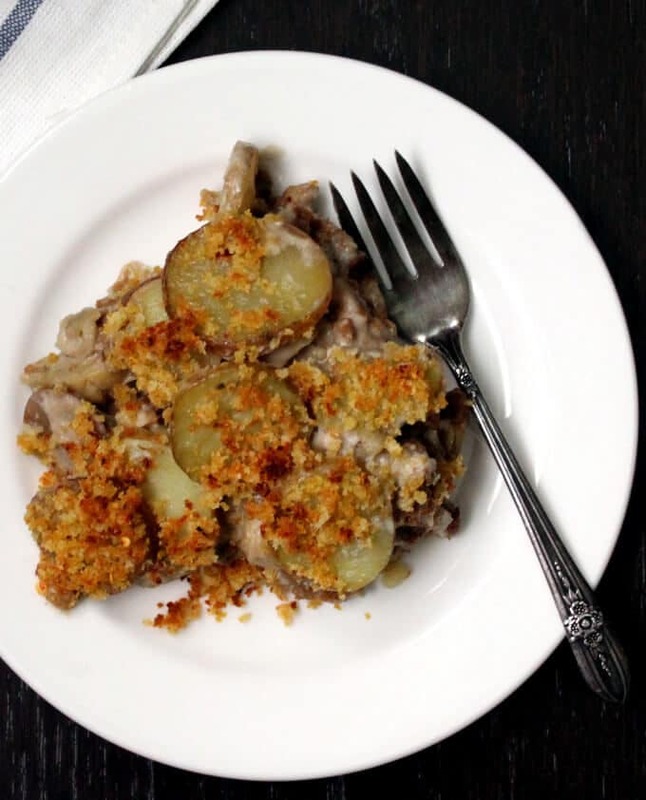 There is an addictive combination of crunchy and creamy in every bite of this vegan Artichoke Potato Gratin, a perfect dish for breakfast, brunch or dinner. It brown-bags really well too. Artichoke hearts and potatoes are baked with meatless “beef” in a bubbly, creamy and cheesy cashew sauce. Over all this goodness you scatter golden, seasoned breadcrumbs. 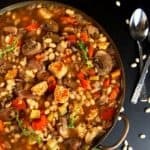 Here’s a recipe that looks comforting, tastes delicious and is extremely easy to make, with just about 15 minutes of hands-on cooking time. My Vegan Artichoke Potato Gratin. Each bite of this dish is creamy and has the unique flavor of artichokes. These thorny green globes are in season now, but I made my job a little easier by using frozen artichoke hearts because who has the time to prep artichokes? Not me. Besides, unless you’re farming artichokes in your backyard, it’s likely much more economical to just use the frozen or canned variety. But if you do have fresh artichokes, and the time to prep them, please use them by all means. I like combining artichokes with potatoes and the beefless “beef” in this recipe because it makes it a complete and very filling meal rather than a side. 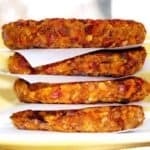 The best part is, it is really versatile– this is an awesome breakfast or brunch recipe, but it also makes for an elegant and filling dinner. Or lunch. 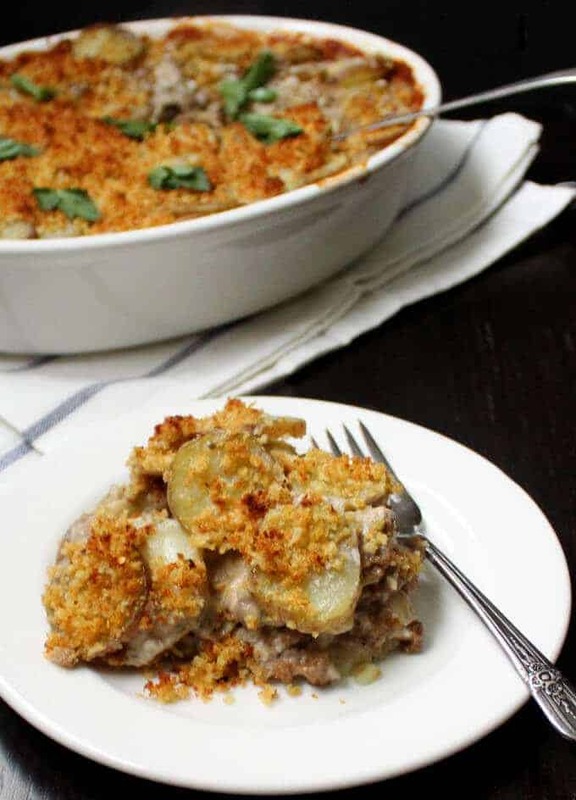 The breadcrumb topping on this gratin is really, for the lack of a better metaphor, the icing on the cake. 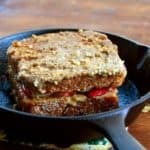 The breadcrumbs toast up all crunchy and golden, and they are cheesy with nutritional yeast, savory with herbs, and quite delicious, really. You can serve this vegan gratin with a fresh, green salad and make it a lunch or dinner. Because there’s protein, veggies and carbs in this dish, however, it’s perfectly great and nutritious on its own as well. How’s your weekend going? After an unending winter, we are finally getting some warmth and sunshine in the DC area. In fact, this is a great dish to make on a day like today — unless you have plans for a barbecue — because you need so little time to put it all together, and you can spend the rest of your day hiking or biking or gardening or playing with your kids or anything you’ve got a mind to. I am off to enjoy my day now. Happy Sunday! 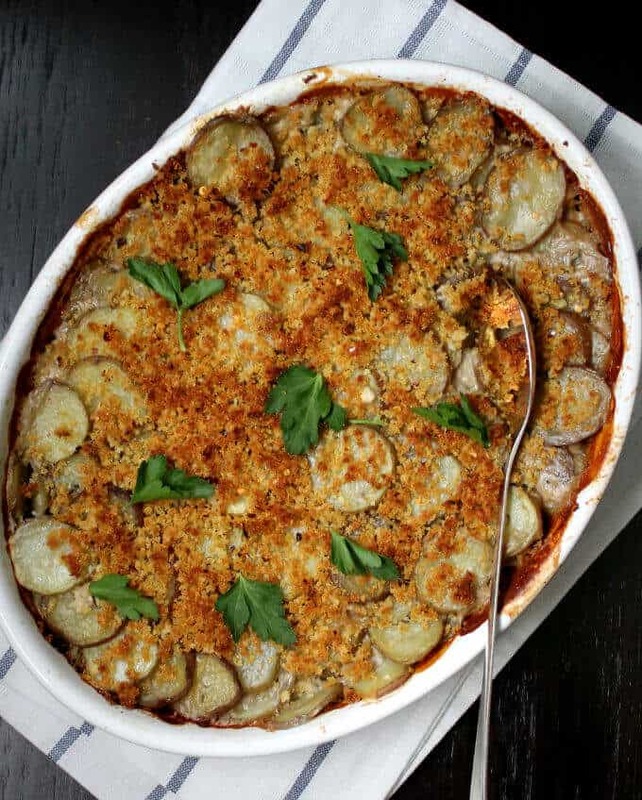 There is an addictive combination of crunchy and creamy in every bite of this vegan Artichoke Potato Gratin, a perfect dish for breakfast, brunch or dinner. It brown-bags really well too. Artichoke hearts and potatoes are baked with meatless "beef" in a bubbly, creamy and cheesy cashew sauce. Over all this goodness you scatter golden, seasoned breadcrumbs. Heat oil in a large skillet. Add the onions and garlic and season with salt and pepper. Cook, stirring, until onions are softened. Add the beefless beef, stir to mix, then add the artichoke hearts and the thyme and continue to cook another 5-10 minutes until the artichokes are just tender. Check seasoning and turn off heat. Place the cashews in the blender with garlic powder, salt and ground black pepper to taste and 2 cups water. Blend until smooth. 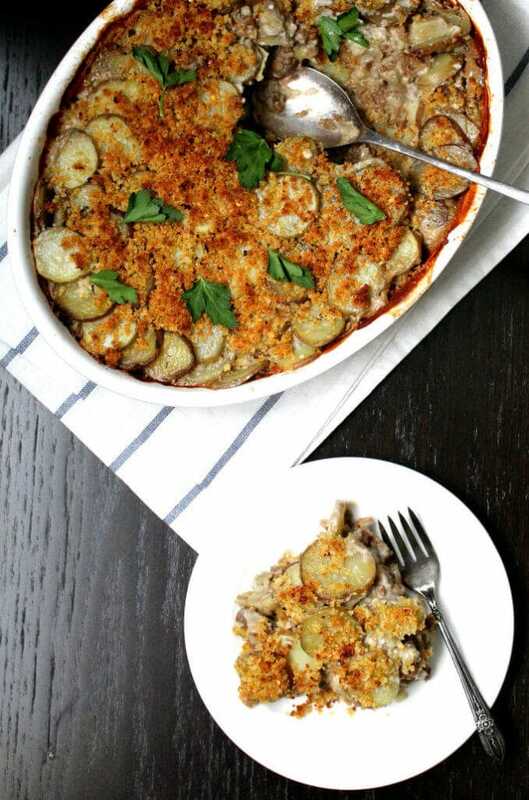 To assemble the gratin, layer or shingle half the potatoes in the bottom of a baking dish approx. 10 inches by 8 inches and 2 inches deep. It's okay if some potatoes overlap. Spoon the artichoke mixture on top of the potatoes in an even layer. Cover the artichoke mixture with the remaining potatoes. Shingle them in a decorative fashion for a nice look to your gratin. Pour the cashew mixture over the gratin evenly. Press down on the potatoes with a spatula to submerge them as far as possible. Cover the baking dish tightly with a foil. 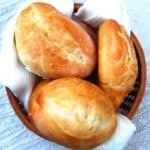 Place in the oven and bake 45 minutes or until the potatoes are tender. 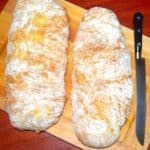 Mix the breadcrumbs with the olive oil, nutritional yeast if using, thyme, and salt and black pepper. 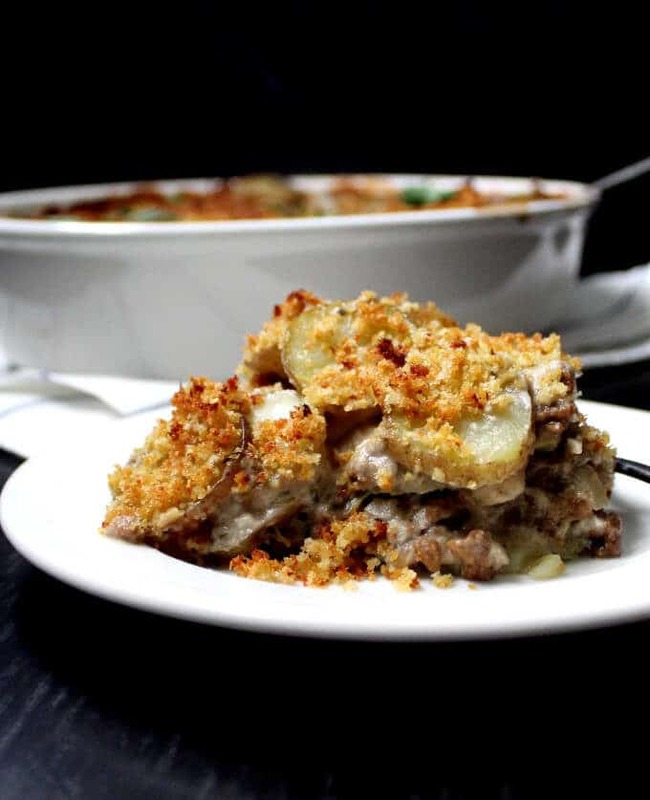 Remove the baking dish carefully from the oven, remove the foil, and sprinkle the breadcrumb topping over the gratin. 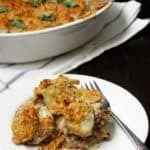 Return the gratin to the oven, without the foil covering this time and bake another 10-15 minutes or until the breadcrumb topping is golden and crunchy. Let stand 5-10 minutes before serving. *The nutrition info below is calculated based on a 13.7 oz package of Gardein ground "beef" instead of the Trader Joe's beefless beef, because the nutrition calculator I use does not have that information. 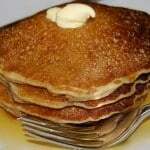 You can use one or the other in the recipe. Wow! This sounds delicious! I missed seeing the nutritional information. Can you supply or direct me to where it is? I am counting calories these days. Literally. It’s the only thing that really works for me. And once again, I am so glad to have your emails coming into my life. 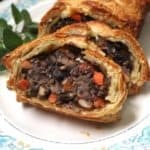 It reminds me that a plant based diet is not bland and boring, and doesn’t have to be a pile of salad and sprouts (although that is good too!) And keeps me steady towards living in a world with less killing and more life. Hi Sharon, I added nutritional info, but because the calculator I use doesn’t have Trader Joe’s beefless beef, I’ve used Gardein’s beefless beef. You can use one or the other during cooking. Thanks for your kind words about the blog! Cheers. Fresh artichokes cook really fast and easy in the microwave. Just grab the scissors, trim the spikes off the leaves, and hack off the stems. It doesn’t have to be pretty. Wrap each one in plastic wrap. Arrange on a plate and use the microwave setting for fresh vegetables based on your own microwave instructions. Presto Pronto. Or, arrange in a tightly covered glass casserole and save the plastic from the planet. Might take a dab longer. 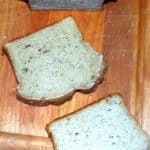 Enjoy the outer leaves with vegan buttery spread and lemon while you use the hearts to make this recipe. 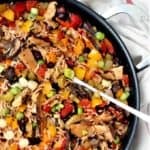 Tried this DELICIOUS recipe for dinner last night, and wow!! Like you said it’s a great meal by itself. The kids were licking their plates. 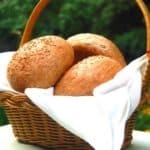 Thank you for another amazing recipe!!! Thanks so much for sharing this. YUM! Made it as written and wouldn’t change a thing. This dish will be a regular in our home. This was super yummy!! Thank you!! I used trader joe’s lentils instead of the faux beef, and I used pretzels I forgot to pick up bread crumbs. lol It was supper yummy will make again for sure!